Recreational Marijuana is slowly legalizing across the United States and eventually the world! Currently, recreational marijuana is legal in Colorado, Washington, Oregon, Alaska, California, Massachusetts, Maine, Nevada, and Washington DC. This resource is for finding shops near you whether they are medical, recreational, or both. 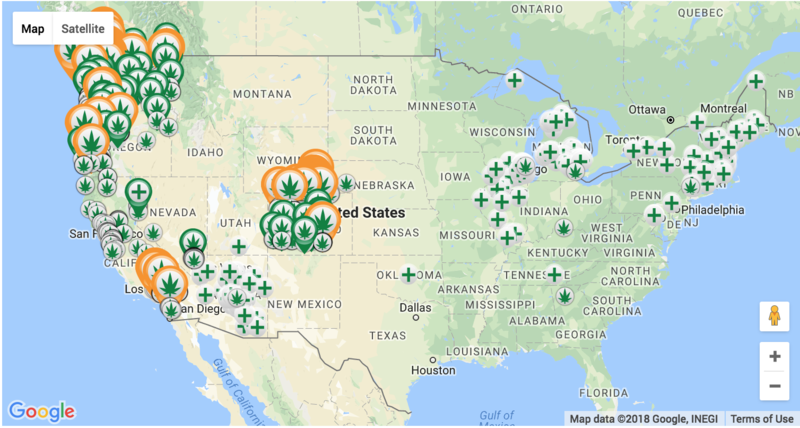 The links below the map will give you information you need to make informed decisions and find the closest pot shop to your location. So whether you’re looking for flower, edibles, concentrates or any other kinds of products these resources are here to help! Now more than half of the United States has legalized some form of cannabis. Although many states have only legalized CBD oil for children with epilepsy, we still believe that marijuana will be legalized nationally in the next 5 years! Until then, keep up to date with the status of cannabis laws in each state using this guide below. We do our best to keep this list updated, but if we miss any important events feel free to contact us! Also, it is recommended that you respect the laws anywhere you visit in regards to cannabis. It’s better to be safe than sorry! Some form of CBD law has passed, but other forms of marijuana remain illegal. Recreational marijuana has been legalized! If you’re over 21, find a shop, make a purchase, and enjoy the brave new world of legal cannabis! Medical marijuana has been legalized, but recreational cannabis is not yet legal. The Arizona Marijuana Legalization Initiative failed to legalize recreational cannabis on November 8th, 2016. Medical Marijuana has been legalized in the state, but recreational cannabis is still illegal. Medical and Recreational marijuana have been legalized in California! If you’re over 21, find a shop, make a purchase, and enjoy the brave new world of legal cannabis! Medical marijuana is now legal, but recreational cannabis is not yet legal in the state. Some form of CBD law has passed, but other forms of marijuana remain illegal. As of Jan 2018, Atlanta recently decriminalized Cannabis possession and is punishable with a max fine of $75! Marijuana is still illegal in this state and penalties can be very harsh. Medical marijuana has been legalized, and recreational cannabis is now legal, too! The Maine Marijuana Legalization Act was passed on November 8th 2016, and adults over the age of 21 will soon have access to legal cannabis. Medical and Recreational marijuana are now legal! Recreational shops should open soon! Medical marijuana has been legalized, and as of November 6th 2018, Recreational Cannabis has been legalized for adults! Keep your eyes peeled for more information as it becomes available! As of November 6th 2018, Medical Marijuana has been legalized! Keep your eyes peeled for more information as it becomes available! Medical marijuana is now legal in the state, but recreational cannabis is not yet legal. Medical marijuana is legal in limited forms (no flower, no smoking, no growing) for patients with specific medical conditions. The program is anticipated to be up and running by January 2018 but, so far, no progress has been made whatsoever. Oklahomans voted in favor of legalizing medicinal marijuana on June 26th, 2018! Recreational cannabis remains illegal in this state. Medical marijuana is legal, but patients cannot legally smoke. Possession has been decriminalized in Philadelphia & Pittsburgh but remains illegal recreationally. Medical Marijuana has been legal since early 2015, and medical marijuana dispensaries are open as of January, 2017. Medical marijuana has been legalized, but recreational cannabis is not yet legal. Both Medical & Recreational Cannabis are legal! There are not any dispensaries open to the public yet, but lounges and shops should hopefully open soon! Recreational marijuana has been legalized, but there are currently no recreational shops open to the public. The only way to purchase marijuana right now is with a medical card. Recreational Marijuana is still illegal in this state and penalties can be very harsh. Medical Cannabis was legalized in 2017, but dispensaries won’t open until 2019.